Wash and dry lettuce. Chop or tear into bite size pieces and add to salad bowl. Wash, peel, then slice or grate carrots. Wash red pepper, cut in half, remove seeds and stem, cut into strips. Wash tomatoes, slice into wedges or if using cherry tomatoes, cut in half. Arrange vegetables in salad bowl. Pour dressing on top. Using two large spoons toss salad so the dressing gets evenly distributed. A Chef Salad would also include any/all of the following: Cheese, ham, turkey, chicken, hard-cooked eggs, and beans. 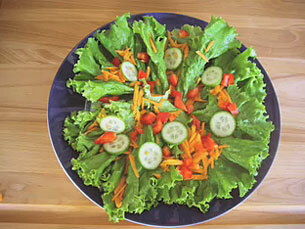 Make your own basic vegetable salad and then transform it into a chef salad with a just a few more ingredients.